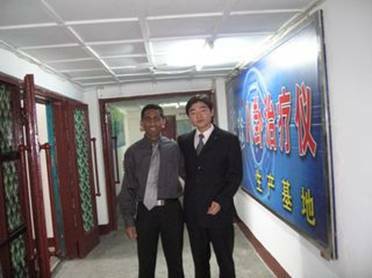 From the website: In October, 2006, the foreign customers from South Africa visited Bluelight Industry Base with great interest. They showed full confidence on the cooperation with the Bluelight Company in the future after viewed and understood the development of the Bluelight Company and the research and production in it. They also thought that Bluelight skin care product is a high-tech medical product with excellent curative effect. It is a very meaningful mission to make it known to the global market, and it is also undoubtedly a great chance for cooperation. They thought the Traditional Chinese Medicine is based on a profound origin that has huge influence in China. Nowadays, more and more foreign people start to believe and accept such a magic eastern treatment. And the Bluelight products are just the classic ones that combine Chinese medicine theory with high technology. Therefore, he strongly advocated introducing this product to the whole world. Bluelight can help promote people's health. HelpBluelight skin care product can be better and better.